Persian style Hereke carpet. 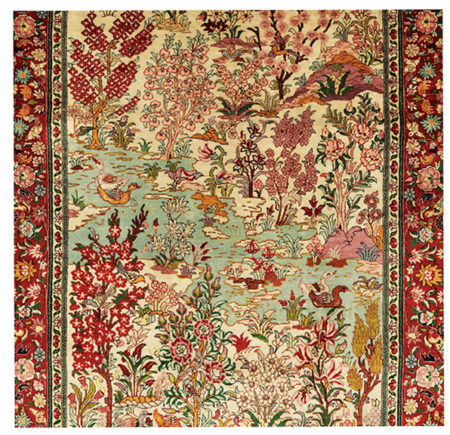 This carpet boasts tightly knotted silk on silk weft, depicting blossoming trees and a garden in a mountain landscape with a stream flowing through the center. Birds of paradise, ducks, parrots and magpies can be seen swimming through the stream and perched in the trees. The imagery is framed with a triple serpentine motif in ivory, burgundy, and soft green hues.